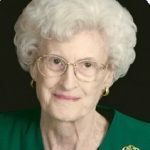 Millie Ree McDonald, 86, a resident of Highland Village, Texas, passed away November 20. She was born September 25, 1931 in Andrews, Texas to Dennis and Fern Nix. After high school in Andrews, Millie graduated from Hardin Simmons University in Abilene, Texas in 1954, and later earned a Master’s Degree of Education from North Texas State University in Denton. She married J. W. (Jay) McDonald on June 11, 1954 in Andrews, Texas. They would enjoy a loving marriage of 57 years until his death in 2011. In addition to her husband, Millie was preceded in death by her parents Dennis and Fern Nix, and by her younger brother, Drexell Nix. Millie taught school for over 25 years most often teaching third grade. Starting in Lillian, Texas, Millie continued teaching in Cleburne, Jacksboro, El Paso, and Granbury as her family moved. Millie was active in several Baptist churches she and her family attended, frequently running Sunday School Departments or teaching a class. After her retirement from teaching in Granbury, Millie and Jay lived for several years near her son in Wimberley, Texas, and two years after her husband’s death Millie moved to an assisted living facility near her daughter in Lantana, Texas. Millie is survived by an older sister, Coza Ree Bostick, of Miami, Oklahoma; by her daughter, Nancy Higginbotham, and her husband Taylor, of Lantana, Texas; and by her son David McDonald, and his wife Sheryl, of Wimberley, Texas. Millie also is survived by two grandsons Jonathan Williamson and his wife Kimberly, and Jeremy Williamson and his wife Brittni, and three great grandsons Henry age 8, Jude age 5, and Grayson age 2. Visitation will be held at 1 p.m. Saturday at First Baptist Church, Granbury, with services following at 2 p.m. Graveside services immediately following at Holly Hills Memorial Park next to the church. Funeral arrangements entrusted to Martin’s Funeral Home in Granbury, Texas.